Oh baby it’s getting cold outside! 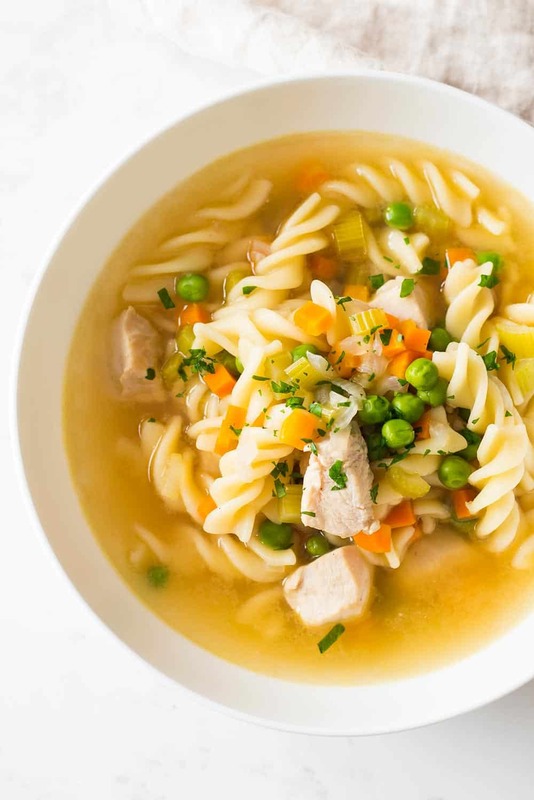 Warm up with this ALL IN ONE POT Instant Pot Chicken Noodle Soup. Chicken breasts, veggies, pasta, chicken broth and about 20 minutes of work is all you need. 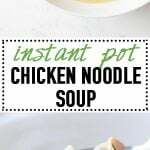 Let’s all celebrate the cold weather with some Chicken Noodle Soup made in the blink of an eye in the bestestest (yes, that’s a word) of all best kitchen gadgets: the Instant Pot! I’ve told you many times that I L>O>V>E this thing but let me tell you again. It is a freakin’ fantastic tool!!! You can make chicken and rice in 30 minutes, sweet potatoes in 20 minutes, and many more healthy instant pot recipes without fuss and absolutely fail proof. What I love the best is that it doubles as a slow cooker, too. That’s a whole other story though and I’ll get back to it in another post. Now let’s focus on this super delicious fall-welcoming Chicken Noodle Soup, shall we? Now, when trying to get inspired by other people’s recipes I soon noticed, most recipes out there pretty much call for cooking each ingredient separately. What’s the point of using the instant pot then? Where is the advantage if I cook first chicken, then veggies, then pasta? There had to be a better way. I wanted to find the magic formula for an all in one pot Instant Pot Chicken Noodle Soup that required only the pot itself, a chopping board, a knife and a wooden spatula to get dirty. I found it :) I found the magic formula! You need to chop the veggies super small. Fry the onion and garlic. Then stir fry the cubed chicken just a little bit until it’s mostly white from the outside but still raw in the middle. Then add all other ingredients, lid on, high pressure cooking for 5 minutes, quick pressure release, add peas, finished. Yes, it’s that easy! 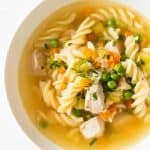 What vegetables are best for Instant Pot Chicken Noodle Soup? I recommend using carrots and celery for this soup. They are hard enough to soften up to the perfect consistency in 5 minutes high pressure cooking. Other vegetables like zucchini or broccoli will completely fall apart. The only vegetables that work are some with similar consistency to carrot and celery such as butternut squash for example or celery root. Sweet potato may work, too, it’s more of a carbohydrate than a vegetable though. Something to keep in mind. Adding frozen cooked peas at the end is perfect for cooling the soup down a little to be able to eat right away. Plus, the boiling hot soup is enough heat for the peas to defrost and taste absolutely delicious. You can also add frozen cooked corn with the same effect. I just ate the last bits of it 3 days after making it and it was perfectly fine. However, the pasta gets softer and softer and softer every time you heat it up. The pasta’s consistency gets worse over time. It’s still edible but simply not as nice anymore. I recommend making the exact amount for that day. It’s so fast to make, simply make it again the next day if you want to eat it two days in a row. So, how long does Chicken Noodle Soup last? In the fridge up to 3 days. But it’s better eaten in one sitting. Oh baby it's getting cold outside! 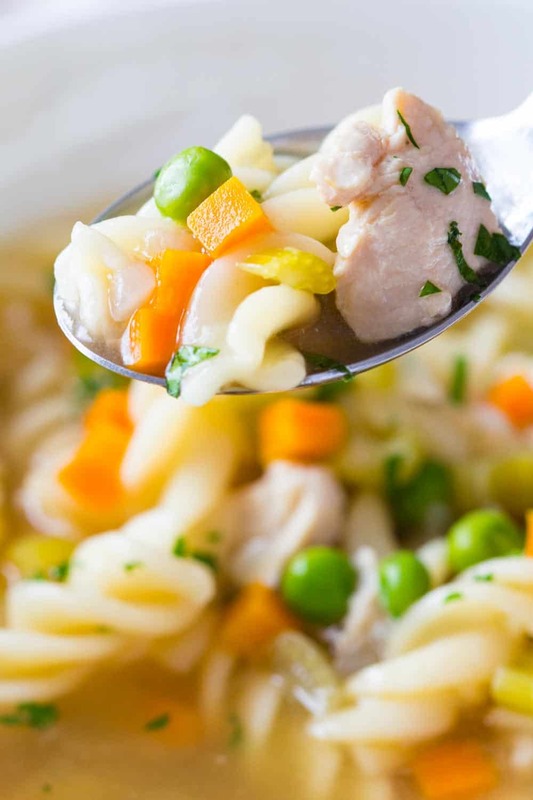 Warm up with this ALL IN ONE POT Instant Pot Chicken Noodle Soup. Chicken breasts, veggies, pasta, chicken broth and about 20 minutes of work is all you need. Preheat instant pot by pressing "sauté" and adjust to high heat. While preheating instant pot, peel and chop onion and peel and crush garlic. Peel and dice carrot, wash and dice celery and cube chicken. Once Instant Pot beeps and shows "hot" on display, add a splash of oil and chopped onions. Stir fry until starting to brown. Move around often. Then add garlic and chicken and stir fry until chicken starts to get white from all sides. Add diced carrots and celery, pasta, chicken broth, some salt and pepper (depending on how seasoned your broth is), add lid, move venting knob to "SEALING" and press "cancel", then "manual" and adjust pressure to high pressure and time to 5 minutes. Instant Pot will need anywhere from 7-15 minutes to come to pressure depending on temperature of broth. 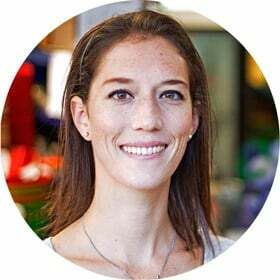 I recommend using broth at room temperature to reduce time of instant pot to come to pressure, it works perfectly fine with cold broth though, too. Once 5 minute high pressure cooking is over, instant pot beeps. Release pressure by turning venting know to "venting". Wait for all pressure to be released and the pin drops. Open instant pot and add cooked frozen peas. Try the broth and season with additional salt and pepper if necessary. Serve immediately with some freshly chopped parsley sprinkled on top. I made this for lunch today and it hit the spot! I almost made it as instructed, but to make life easier on me, I just threw in a bag of frozen, mixed veggies with the pasta and it turned out great. Thanks for such an easy, tasty soup! Super don’t mean to be critical but you didn’t indicate to cube the chicken. I’m one of those lame read every step since I’m not a great cook. Many instant pot and soup recipes call for the chicken to be intact so I had to scramble a bit to cut it when it was time to add since I didn’t watch the video until I started. Totally my fault, just thought I would suggest you listed cubed chicken like you have diced carrots/celery. Oh no, I’m so sorry you had trouble making the recipe. Booo. It’s actually listed in point 2 of the instructions at the end to “cube chicken” but you’re absolutely right. I should have added the “cubed” to the ingredient list as well. Just corrected that. Thank you for pointing it out. I want my recipes to be easy to read and follow for everybody so I really appreciate your comment! I did this, but found that a lot of the broth escaped through the vent when I did the quick release on the instant pot. Anything I did wrong? Oh, I’m sorry you had this problem. It’s never happened to me. Maybe there was still too much pressure in the cooker? Did you make the chicken breast/white rice version or the thighs/brown rice version? Did you wait the indicated natural pressure release time? With broth you do mean the cilantro water, right? I made chicken bone broth. So I want to use it in this recipe. Would the seasoning and amount make any difference? This looks delish! What would the changes be to make it stovetop ot slow cooker? I haven’t tried my recipe in a regular pot on the stove top yet so I can’t give detailed instructions.